It’s My Wedding, Sunshine Coast Wedding Guide … Planning is everything! 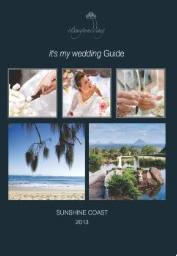 Plan your perfect wedding with our FREE Sunshine Coast bridal magazine. Wedding suppliers from photographers to reception venues, celebrants to hair and makeup, and transport to ceremony venues. Our wedding suppliers cover all areas of the Sunshine Coast – from Caloundra to Noosa and Maroochydore to Montville and Maleny. 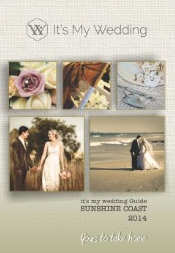 Advertisers – Be a part of the Sunshine Coast Wedding Guide. If you are in the Sunshine Coast wedding industry, find out more about advertising in our next Sunshine Coast Wedding Guide.